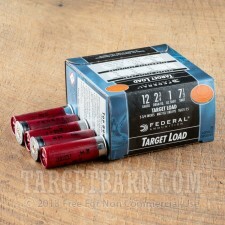 Federal Ammunition has been a trusted name in ammo production since 1922. 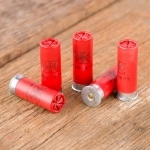 Headquartered in Anoka, Minnesota, Federal offers some of the most reliable and technologically advanced sporting ammunition available to the modern shooter. 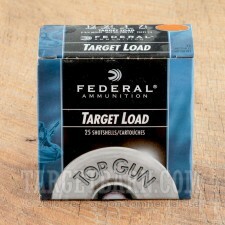 This package contains 25 rounds of Federal Top Gun 12 Gauge ammunition. 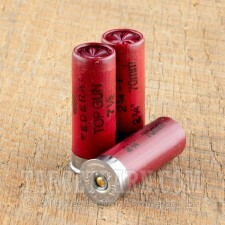 Each 2 ¾ inch shotshell is loaded with 1 ounce payload of #7.5 all-steel shot. These Top Gun Steel loads hit clays hard without being hard on your wallet. Also, featuring a unique wad column for consistent patterns, these loads deliver consistently tight patterns, incredible accuracy, and fun shooting. Know you have a big hunt coming up and want the full case? Get this same load for sale in 250 round packages here. This new production target ammunition delivers a consistent muzzle velocity of 1250 feet per second. 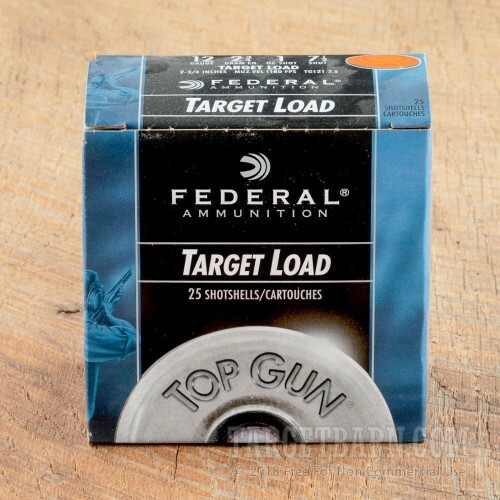 Federal Top Gun Steel loads are a perfect option for high volume clay target shooting, especially at ranges where lead shot is restricted.